The drive to Baratan in North Kalimantan takes around one hour. From the provincial capital of Tanjung Selor, the road skirts the mighty Kayan River, winding through tall jungle and scattered villages. Not so long ago, the river provided the only transport. It still serves as a thoroughfare linking the coastal Malay settlements to the inland Dayak communities. The village school, SD 8 Baratan state elementary school, appears beside a stream, two rows of terraced classrooms form a neat L shape, flanking a grassy playground. Like every other building in this remote corner of Indonesia, the school is constructed of timber clapboard, cut from the surrounding jungle. The visitors are met with traditional dances. It is immediately clear there is something different, something special about this school and its community. 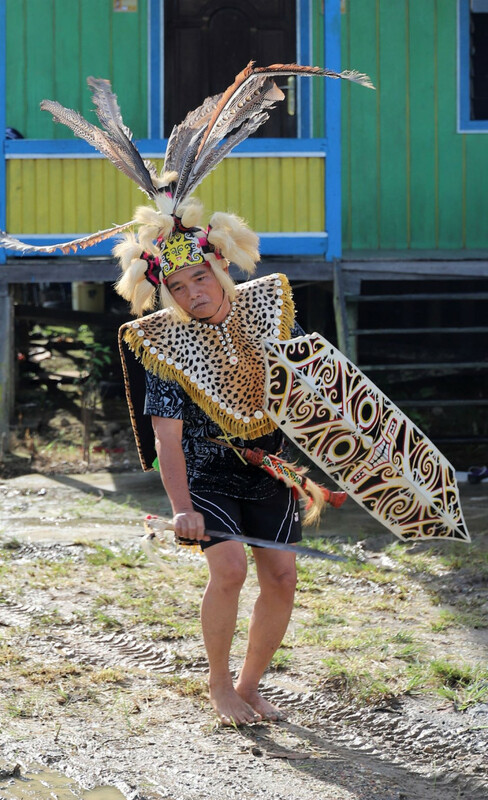 The dancers, children elaborately dressed in traditional Dayak costume – cured bark, leopard skin, feather headdresses and the swirling motif of the Kayan Dayak – are led by two teachers. To the beat of a gong and accompanied by whoops and hollers, Kuleh Lenjau leads the boys in a wild stylized war dance, while his wife, Yohana Agustina, leads the girls with graceful movements suggesting the flight of a hornbill. The Dayak welcome is followed by an Islamic dance, another group of girls and boys dressed in satin Malay costumes. Here both traditions are honored. Both exist side by side. But it is in the classroom that the real change is evident. Kuleh Lenjau is teaching grade one. The classroom is brightly decorated with children’s artwork; a linoleum mat designates the reading corner where well-stocked bookshelves welcome young readers. At the front of the room, the children sit on a mat. Pak Kuleh is reading a book to the class. Now dressed in regular clothing, his Dayak outfit, shield and sword are stacked in the corner behind him. 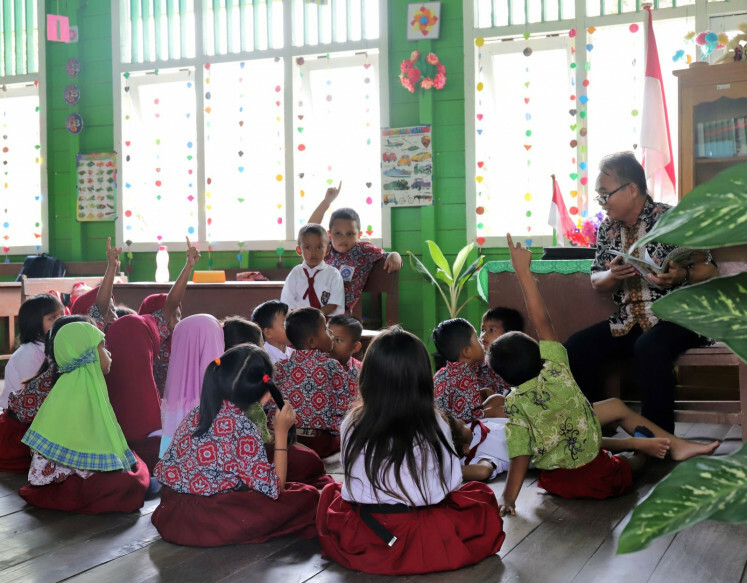 The children’s faces say it all; smiles and rapt attention as Pak Kuleh tells the story, every so often stopping to ask a question, to stimulate the children’s thinking, to stir their imaginations, sometimes drawing their attention to the colorful illustrations or key words on the page. This is a far cry from the often dry and boring lessons with children seated silently in individual desks attempting to make sense of a text book. This is the basis of what educationalists call “literacy” and ‘higher order thinking skills’. After the lesson, Kuleh Lenjau explains how it all came about. The 59-year-old teacher was born in 1960 in the Dayak Bakung village of Long Metun. Back then, it took 15 days to travel from Tanjung Selor to Long Metun in the isolated upper reaches of the Kayan River. The trip, paddling against the current in a dugout canoe and walking up and down hills, was hard. It is easier these days with an outboard motor, but still takes about a week. Pak Kuleh began his education in Long Metun in 1969. He had to cross the big river to attend the larger school in Long Peso for grades 5 and 6. He completed junior secondary schooling in Peso and senior secondary at a teacher training high school (SPG) in faraway Tanjung Selor. 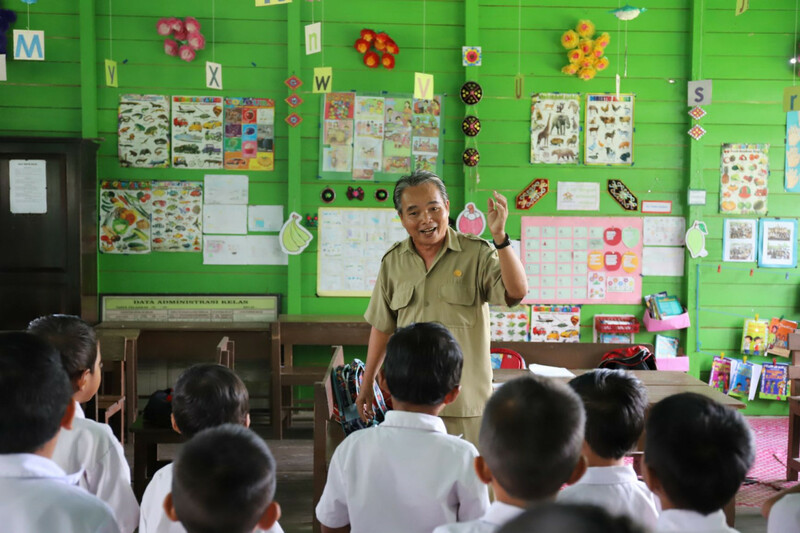 Speaking quietly, Pak Kuleh explains why he decided to be a teacher. The experience in Long Metun made a deep impression. His village school had only two teachers. The children came from neighboring villages that didn’t have schools. To get to school, these children had to row a canoe. They had to wade through a wide river. Their spirit to learn was high. But Pak Kuleh's plan to serve his hometown never materialized. After graduating from SPG in 1982, he was accepted as a government teacher and assigned to a school near Tanjung Selor. At that time, the area still lacked teachers; 36 years later he is still at the same school, SD 8 Baratan. He is due to retire next year. In 2018, Pak Kuleh joined the 49-million-dollar Australian government-funded Innovation for Indonesia’s School Children (INOVASI) program. The program, which began in 2016, works with teachers and administrators in West and East Nusa Tenggara, North Kalimantan and East Java. The aim is to explore new ways of teaching and learning – to find out what works – so that policy and practice can be improved in schools, districts, as well as at provincial and national level. In the middle of his first INOVASI workshop, Pak Kuleh asked if he could leave. "Honestly, I felt that my brain was too old, that I could no longer absorb new ideas," he says. But his colleagues persuaded him to stay and he hasn’t looked back since. After attending various workshops, Pak Kuleh has begun to change his teaching approach. He now uses a variety of learning media that he collects from around the school. He uses guava fruit, for example, to teach simple counting. Sometimes he uses seashells to invite children to play a word choosing game. The children are now used to working in groups. The classroom looks different too, with media and learning resources displayed on the walls. The change is not confined to one classroom. Other teachers have also changed their practice. Every Saturday morning they get together for a professional learning activity. Each class has a reading corner, and the children read every day. The principal is more active in the classrooms and parents are getting involved. In 2017, INOVASI surveyed children in the region and found that around 85 percent love to read. The problem was not motivation. It was that they didn’t have access to attractive and appropriate children’s books. And the teachers didn’t know how to teach reading. This is all changing. Bulungan district is now providing training in school clusters to all primary teachers. 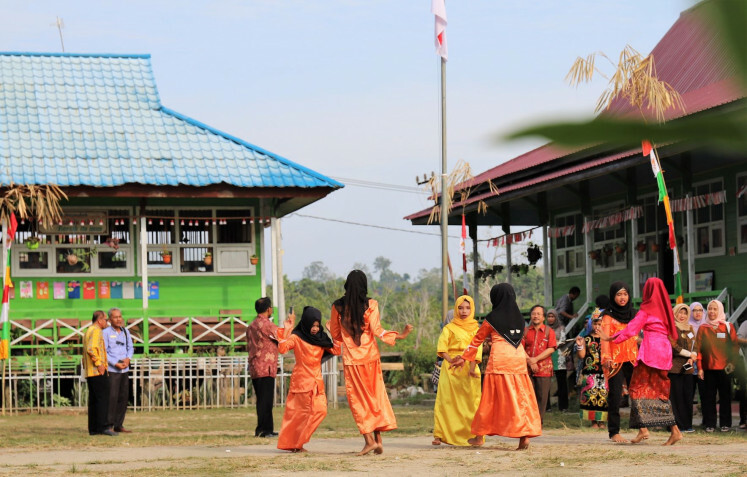 The district has also passed regulations to make good children’s books available in all schools – and villages are setting up community reading centers in places where people gather, like shelters beside the river in Tanjung Selor. Even the governor’s wife has got behind the campaign, and is now known as Bunda Baca (Reading Mother). The great thing is that it’s all being paid for by the district, the schools, the communities and the teachers themselves. Pak Kuleh says the changes have had a positive impact on his pupils. They are more eager to learn and their learning outcomes have improved.